One of my more ambitious projects is the creation of a complete 28mm ruined city environment for the Mordheim skirmish game. 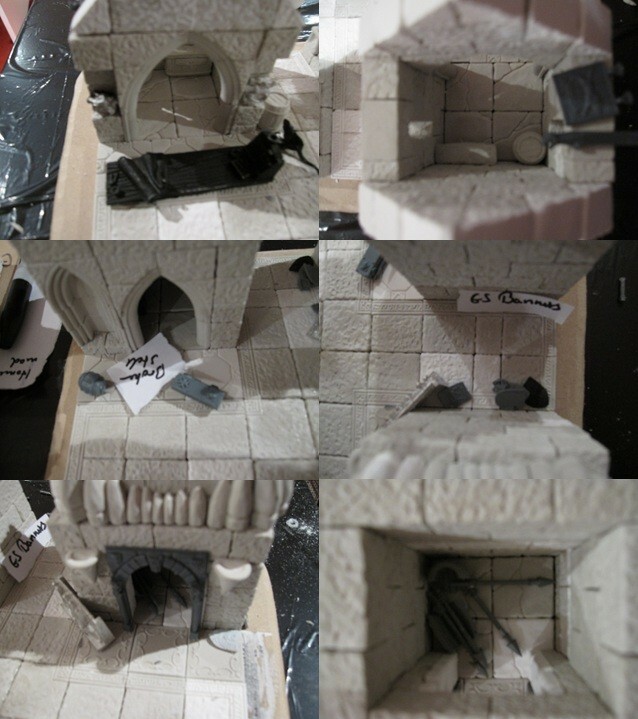 This tutorial describes my fabrication process for Mordheim buildings. For gameplay reasons the buildings need to be modular so each is an individual piece. I use a set of custom walkways and ladders to connect buildings in a particular game setup if needed. Purchase Hirst Art molds. I selected a range of mold with basic blocks and some nice details in the gothic and fieldstone set. I also made some of my own mold from two-part silicone. These molds where mostly done to replicate accessories (e.g. barrels, crates, etc) but some also helped to speed up the casting progress (e.g. the fieldstone block mold doesn’t have a lot of actual blocks so I used completed fieldstone blocks to make a mega-mold that delivers 50+ blocks in one cast). Plan your buildings and write down how many parts you need for each. For convenience I used some of the Hirst Art building plans though I ended up modifying them as I went along as well as building some home-made creations. Counting parts up front saves you from having to re-cast all the time while you are building. Cast like mad. I use UltraCal 30 because it delivers rock hard blocks. You can try lighter variants like HydroCal but definitely don’t use Plaster of Paris. It is brittle and will give you nothing but grief. UltraCal 30 yields parts that can only be cracked with tools! I used a fairly common casting setup: A vibration table “powered” by a hand-massager, a spray bottle of “wet water” (water + dish washing liquid) to avoid bubbles and a 4” scraper. For any kind of reasonable projects you will need to cast each mold dozens of times. UltraCal dries slowly (~1hr per mold) so this is definitely something to do in between other activities. In my case I left the casting station set up and did two runs each evening. Two weeks later I had plenty of blocks. There are plenty of tips on the Hirst Art webpage. I use Weldbond to glue the blocks together as it gives a much stronger bond than white glue (PVA). It also stays “elastic” for a long time. I was often able to glue a layer of bricks, let it dry for 30 minutes to work on something else and then still be able to forcefully push parts around a bit to fit the second layer. I build each story of a building separately and left floors detachable as well. For tight interiors I also leave the walls separate (usually two L shapes). This makes painting a lot easier. When you build multiple floors I recommend building the ground floor from the top down (i.e. start with the HIGHEST block layer in that floor) and the next higher floor from the bottom up. This ensures that the two floors will match up perfectly when you are done. The bottom of the ground floor and the top of the higher floor might be uneven in height or have become bend/distorted while you build but that perfectly fine since they don’t mate up with anything (though you might need to sand the ground level to fit flush on the base. For floors and other thin parts I use cardboard backing at the bottom for stability. Just glue everything onto thin cardboard and trim off the excess when everything is dry. Cardboard covered in glue with warp so put something heavy onto the wet assembly until it is dry. With the core structure completed its time to cut the base. For stability I base all my terrain pieces. I use 1/8” (~3mm) MDF. MDF is great because it doesn’t warp as much as hardboard and is very steady over time. That allows me to get away with such a thin layer and still get perfect stability. Draw a rough outline onto the MDF sheet with a reasonable amount of extra space around the building for small addons (e.g. barrels, etc). I cut the MDF pieces with a Dremel scroll saw (a wonderful tool) at a 60degree outward angle and then use a Dremel rotary tool with a sanding bit to put an even steeper (and varied) angle on top. This results in a very shallow transition from the terrain board to the MDF base. When cutting and sanding MDF make sure to wear a breathing mask and goggles. This stuff isn’t good for you! I don’t glue anything to the base yet except the floor pieces (see next steps). Nor do I glue bigger sections together. This makes painting of the pieces a lot easier. Place the buildings on the MDF bases and start to glue down the flooring. In most cases I use Hirst Art floor molds (flagstone and decorative variants) but for variety I also use different types of styrene sheet or wallpaper with embossed stone-like pattern. I like to do this while the building is standing on the base (not glued) to make sure that the floor fits nicely. During the casting stage I use lightweight HydroCal for about ¼ of the floor tile casts. I use these pieces for the edge of the floors where the tiles meet the wall. Unlike UltraCal 30, HydroCal can be easily shaved with a hobby knife so this makes the fitting process to a usually not perfectly straight ground wall very easy (and floors glued on MDF don’t need to strength of UltraCal wall blocks anyhow). I usually also pain the floor at this stage since it can become very tricky to drybrush properly once the building is on it. Inevitably, at least for my level of skill, some of the blocks will have bubbles in them. There will also be gaps in the building where blocks didn’t match up perfectly because your building geometry wasn’t perfectly square, etc. I use Green Stuff to fill in all the bubble holes and imperfections. This sounds tedious but if your casting is reasonable you shouldn’t have more than a dozen bubbles per building and green stuffing rock isn’t all that hard. It will be well worth the effort! In case you are wondering why bubbles are such a big deal – its rocky fieldstone after all – the reason is that the bubbles break the illusion of scale. The bubbles are obviously “human scale” and not “miniature scale” which for some reason draws the eye and spoils the illusion. For some stone types such as fieldstone it is also possible to use a Dremel or knife to just carve off the entire bubble area. Obviously this only works with irregular patterns. At this point each building is actually a set of separate parts (walls, floors, etc). Most of that is for convenience during painting but some separation will be needed for game-play as well. For example, skirmish games require access to ground floors which might be blocked by upper floors. Thus, at least floors will stay separate. They will most likely be held in place by gravity but I like to protect things against the accidental elbow as well as ensure that floors are always nicely aligned. This is achieved with neodymium magnets, the same type used to make interchangeable weapons on models. I use a variety of sizes depending on the size of parts that are supposed to be held together. The process is the same though: I measure out the right spot for the magnets and make magnet-sized holes using a Dremel rotary tool with an appropriately sized end mill bit. Insert magnet and secure with superglue. When one size is try I make a larger hole in the other part, fill it halfway with Green Stuff and then stick another magnet in it (check that they have the right polarity unless you want levitating buildings). I then place both parts together and push them to the right (seamless) alignment. The slightly larger hole for the second magnet allows this to happen and the Greenstuff will hold it in place once it hardens. Both magnets should be placed a bit deeper into their holes than their height so that they don’t touch. Touching magnets will scrape off paint over time. Alright, thousands of blocks have been made and glued together. Now it’s time to vent some of the built up frustration with these little buggers. For this I sort all my left-over blocks by building (e.g. all the field stone blocks and skulls go into a pile for the fieldstone building with skull decorations). Then those piles get vigorously pounded with a HAMMER. Yup, smash them to pieces. UltraCal is hard enough to break cleanly and not turn into powder when you do this. The resulting debris goes into labeled ziplock bags and will later be used as rubble/debris around the ruined buildings. It sounds crazy to destroy so many of your painfully made blocks but it’s worth the sacrifice. Ruined building without debris look very odd (another spoiled illusion) but for some reason that’s a very common thing that people forget. Many of the terrain builders who remember to put debris use gravel or cat litter. That’s a step into the right direction but still doesn’t quite look right. Buildings that were made out of stone blocks don’t collapse into round boulders or jaggy litter. In reality walls tend to break mostly along mortar lines and not through the bricks. Even if the bricks break, they don’t break on all sides to become round or jaggy multi-shapes like gravel. Crushed UltraCal blocks fix this problem and give you very realistic debris, especially if you sort it so that the debris matches the ruined area (e.g. a ruined wall with windows has some debris with a broken window frame in it, etc). This is the bits box stage. The Hirst Art blocks are fantastic to build core structures but have pretty limited detail. To fix this they will be liberally doused in plastic and metal bits from the Warhammer range (or Warhammer 40k or whichever game/scale you are building). Added to this will be home made pieces out of balsa wood, Green Stuff and so forth. I go through each building and careful assign a pile of bits, fitting them roughly in place to get a feel for the overall look. Blue tack helps for mounted bits. I usually try to give each building a distinct theme and match bits appropriately. When everything is laid out I take some reference photos and mark spots where the building core needs to be modified to mount bits. Usually this means drilling holes to stick in plastic or wood poles (for signs, etc) or carve slots into the bricks for figures that go into niches, etc. This is achieved with the trusty Dremel tool and the bits go into a labeled ziplock bag. Aside from small details, some of the buildings will also require larger additions. For example, most stone buildings will need roofs, some will need wooden upper floors and some will need other wooden components such as stairs. I build these at this stage out of balsa wood. Floors are made out of balsa planks supported on 1/8” MDF for stability. Dry fit them on the stone core structure but don’t glue them on yet. Painting different materials separately really speeds up the process and avoids transition mistakes. Some types of casting material require sealing or they will soak up copious amounts of paint (and get brittle). Those areas are coated with a mix of Weldbond and water. The mix should be fairly fluid to avoid clogging up details. Let it dry for a day or so to make sure that the layer is really solid. The entire stone structure receives a fairly sloppy undercoat of black latex household paint. It needs to go on sloppy to force think paint pools into all the cracks and indentations of the stone structure. I usually glob on the paint with a stabbing motion to get it into the cracks and then brush over the raised surfaces with a sweeping motion to avoid blobs on them. This is a messy process and should be done patiently in multiple steps: Undercoat half of the model and let it dry on the unpainted half, undercoat the other half and let it dry on the dry painted half, and finally go over the entirely dried model to fix areas where white UltraCal is still showing. If possible I let each of these stages dry overnight as the deep pools of paint can stay moist for a long time. At this stage the base is textured as well. I use Vallejo Pumice which I mix with some black paint to get it undercoated for free. Once the building is nice and black, its drybrushing time. My default stone technique is successive drybrushes of grey tones. I use cheap craft acrylic paints and usually just start with a base grey that I then darken with black, use directly and lighten with white to achieve three grey tones respectively. I have a selection of grey tones from dollar stores to make buildings look just a bit different (e.g. neutral greys, brownish/creamy greys, bluish greys, etc). The base receives a drybrush with Bestial Brown followed by Bleached Bone. I use large paint cans custom mixed by a painting store to match those two Games Workshop colours. A 1 gallon can will last a wargaming lifetime and is a lot cheaper than tons of little GW bottles. Fieldstone buildings are either done in a similar grey or a variety of brownish tones. In both cases I use coloured washes to cover some of the bricks and thus create a natural variation between individual stones. I pretty much use all the GW washes for this (yes, including purple, red and blue). Afterwards the entire building gets a wash with a brown colour to blend the stones together. The examples below show a fieldstone wall made with this technique as well as a fired brick wall using individual brick colouring with just brown/black tones followed by a brown wash (the brick wall is the foundation for a wooden floor, hence the unfinished top). While the paint steps dry on the core structure it’s time to build the wooden additions to the building. Most Mordheim buildings are a blend of stone and wood components which gives that interesting ramshackle look. I use balsa wood with two main raw components: ¼”x ¼” 2’ long for framing, 1/8” flat sheet for floors. In addition I usually pick up a supply of random parts that hobby shops sell in cheap bundles. Floors that will carry models are reinforced with a layer of 1/8” MDF cut to size. The balsa wood 1/8” layer goes on top as it is easier to carve planks into balsa than into MDF. I paint the detail bits separately before gluing them onto the building. To speed up this process I use hot glue to attach all pieces of a building to strips of cardboard (6” x 1”). This allows for easy handling and “assembly line” painting. I then spray coat everything in black and paint each major colour across all strips. After removal of the pieces from the strips I touch up the small points where the hot glue attached (if possible I use attachment points that will be hidden when the item is glued to the building). These pieces will go onto terrain so extreme painting precision isn’t needed. A decently clean paintjob with some strong shadows/highlights is usually better than the perfectly blended detail job. Wood: Basecoat of Scorched Brown, drybrush of Bestial Brown and Devlan Mud wash.
Metal (Brass/bronze types): Basecoat of Tin Bitz, drybrush of Vallejo Brass, Devlan Mud wash. Verdigris is done with random washes of Hawk Turquoise, Green Wash and Vallejo Verdigris. Afterwards a final light drybrush of Vallejo Brass. Metal (Rusted): Basecoat of Tin Bitz, stipling of Dark Flesh, stipling of Vermin Brown, stipling of Macharius Orange. Drybrush of Boltgun Metal on edges. The image of the unfinished “mad scientist tower” below shows the result of some of these formulas. Once painted, all the detail parts can be attached to the building. I use super glue and afterwards touch up the glue spots with a bit of Devlan Mud wash to take away the shine of the glue. For the attachment I just follow the plan from step 9 with some variation when the mood takes me. Bigger pieces such as tables are not glued to the building. Instead I drill a narrow deep hole into the building and glue a matching brass rod to the detail piece. This allows me to remove the piece during gameplay to make room for models (who would presumably be able to walk around the table even if their “wargaming base” prevents this on the tabletop. I don’t use magnets because the detail pieces are often too small to hold decent sides magnets and the tiny magnets don’t have enough strength to prevent accidental movement during gameplay. At this point I usually weather some of the high traffic areas. This is done by stipling on a light coat of the base colours (Bestial Brown and Bleached Bone) to give the impression of mud carried by boots onto the stone structures. The bridge and staircase for the (unfinished) toll house are good examples of this. Other types of weathering are used in specialty cases such as leaking pieces which have fluid stains under them (using washes). Once everything is done, I give the building two light coats of matte varnish. Terrain doesn’t get handled anywhere near as much as miniatures so there is no need for the extra protection of gloss varnish. The ground is randomly covered with static grass patches. My vision of Mordheim is that of a dirty, muddy medieval city rather than the ornate stone pavements of “high fantasy” cities (e.g. the cities of Gondor in Lord of the Rings). Some grass breaks up the brown earth nicely. As a side effect, this allows me to use some of the buildings for villages in “green pasture” Warhammer battles. Other nature elements include Ivy and other creeper plants, especially on ruins where they evoke the proper “abandoned” feel. Mission Accomplished. Now it’s time to enjoy the finished product (and plan the next one)! Images of finished buildings can be found on the Mordheim City page in the Games & Armies/Mordheim section. Beautiful work… and inspirational with what can be done with Hirst arts kit.. A lot of the other stuff I’m finding tends to be the same ol’ same ol’ just following the instructions.